Can Beef Shoulder Roast Be Sliced and Cooked Like Steak? Do You Need to Marinate Flat Iron Steak Before Grilling? Raw steaks on a cutting board. 4 Can Beef Shoulder Roast Be Sliced and Cooked Like Steak? Flat iron steak is one of the most tender steaks you can buy, second only to tenderloin. Not only is it easy to work with, adapting well to most marinades, rubs and seasoning, but it is much lower in price than a tenderloin. It may not be the best cut for dieters, however, because the marbling you see throughout the steak is fat. If lean meat is what you are after, MayoClinic.com recommends an eye of the round, sirloin tip, top sirloin or top or bottom round steak. Marinating meat serves two purposes: It gives the meat new flavors and helps to tenderize it. While tougher cuts of meat, such as skirt or flank steak, can benefit from time in a marinade, tender cuts do not need it. In fact, marinating a tender cut of steak for too long can actually make it become mushy or tough. The three basic types of marinades that you can use to tenderize steak are those that contain enzymes, acid or dairy products. Enzymes found in papaya, figs, raw pineapple, ginger and kiwi fruit break down connective tissues in the meat. Acids, such as those found in citrus fruit or juice, wine and vinegar, denature the meat’s proteins, making it more tender. Calcium found in buttermilk, yogurt and other dairy products activates enzymes in the meat that help to break down its proteins. Because it is already a tender cut of meat with plenty of marbling and plenty of flavor, you do not need to marinate it before grilling. If you want to give it some flavor, simply mix fresh herbs, spices, minced shallots or garlic with some olive oil and coat the meat with it. If you do plan to use an enzyme-, dairy- or acid-based marinade on a flat iron steak that will go on the grill, it really does not need more than 15 to 20 minutes in the marinade to pick up the flavors. 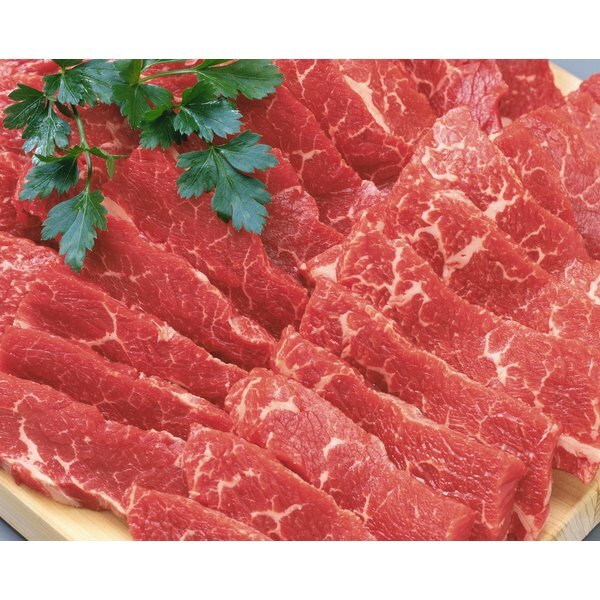 Flat iron steak, also known as shoulder top blade steak, is not considered lean. One 3-oz. serving contains 189 calories, 11 g of fat with 4 g from saturated fats and 5 g from mono-unsaturated fats. It is a good source of iron, zinc and vitamin B-12, but the calorie and fat content may outweigh the nutritional benefits. If you do choose to use a wet marinade for your flat iron steak, consider drying it off before grilling. 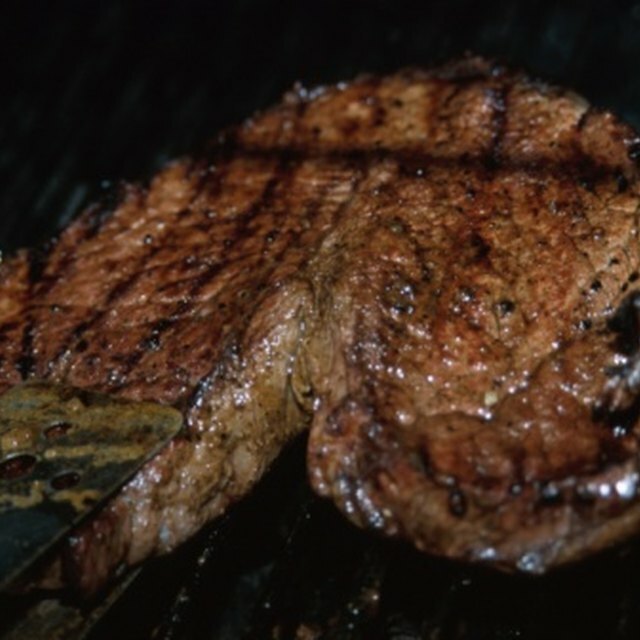 When you grill steaks that have moisture on them, the steaks tend to steam at the beginning of the cooking process instead of allowing the meat to take on a nice sear. Cook thinner flat iron steaks for five minutes on one side on a hot grill, flip them, and cook for another five to 10 minutes, or until they reach the desired doneness. For 1-inch-thick steaks, cook for 10 minutes on one side before flipping them. Always allow steaks to rest for at least 10 minutes before serving. How Long Can Steak Stay Good While Frozen?